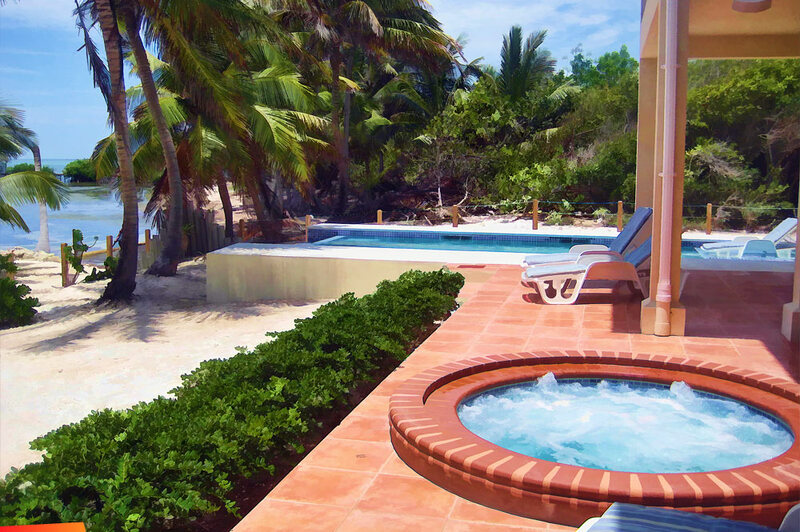 Debbie's Beach is Beautiful four bedroom, four and a half bath beach front home with fresh water infinity pool. The house is positioned so that is has spectacular views of the sunrise and the sunset over the Caribbean. The master bedroom is on the upper level as well as a wonderful large kitchen, living area and den with extensive reading library, cable television and DVD. The lower level has three bedrooms, each with a full bath, and there is an extra half bath. Each bedroom has it's own entrance for privacy. Air conditioning in all four bedrooms and also in the den. Master bedroom has a queen bed, downstairs #1 has a queen bed, #2 has two single beds and #3 has two singles that can also be made into a king. Private pier. Beachside Jacuzzi / hot tub. Two bikes for guest use. On site caretaker for security and assistance. Maid service every other day. Sleeps a maximum of 8 comfortably.